I came across this story today. Published yesterday in the Daily Mail, it reports research in which, apparently, high-fat meals were found to induce sleepiness in individuals, compared to high-carb ones. I have looked for this study on-line and can find no trace of it (only references to it). What this sometimes means is that the reports have been written on the basis of a press release and not the actual study. Increased fat consumption has an acute adverse effect on alertness of otherwise healthy, non-obese adults. 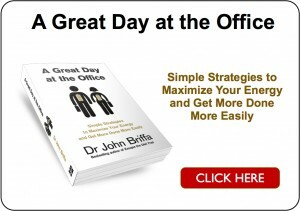 Excessive daytime sleepiness and fatigue are very prevalent in the modern world and are on the rise. It appears that a diet high in fat decreases alertness acutely, and this may have an impact on an individual’s ability to function, and also on public safety. It’s not clear if the fatty foods such as ‘chips and red meat’ or the carbohydrate-rich foods such as ‘pasta or a sandwich’ are the meals that were tested in this study or the journalist’s interpretation of these foods. Anyway, it’s impossible to glean any useful detail about the study from the reports but, as I say, I could not trace the study on-line so remain none-the-wiser. What struck me as I read these reports was how this research appears to have yielded results that are the polar opposite of what I find to be consistently true in practice. Namely, that when individuals scale back their carbohydrate intake and put a little more emphasis on protein and fat (meat, eggs, oily fish and nuts), they almost always see a significant improvement in their energy levels, particularly through the afternoon. Anyway, all this matters less, in my opinion, to the fact that I find improvements in energy and concentration on a lower-carb more ‘primal’ diet to be extremely consistent. But it appears I’m not the only one who has experience of this phenomenon. The Daily Mail allows readers the opportunity to vote on responses given to an article. The system is biased by the fact that the longer a comment has been up, the greater opportunity there is to amass either positive or negative votes. Nevertheless, here below are the most popular responses at the time of writing. What you’ll see here is comment after comment making, essentially, the same point that I make here: carbohydrate-rich diets do not tend to make people more alert at all - in fact quite the reverse is true. The truth is, when individuals scale back carbs and put more emphasis on protein and fat, the usual effect is one of enhanced energy and mental focus. 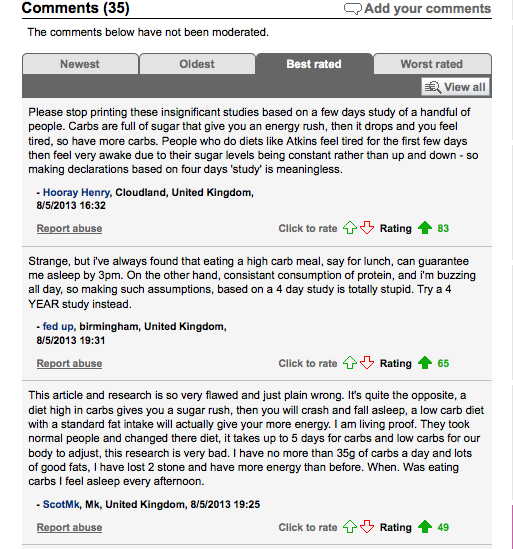 34 Responses to Do low-carb diets really make people sleepy? but it’s in the daily mail…it must be true!! Yeah, my experience is the polar opposite too. I know when I need to function at a high level it’s a low carb breakfast for me. Carbs make me sleepy so I keep them for evening. 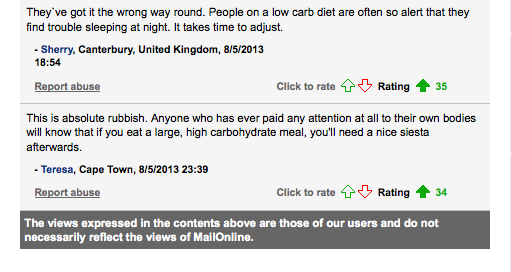 Funny thing about the Daily Mail comments. Often they are pretty stupid but I find that in articles promoting high carb diets or statins, they are often scathing. Maybe it will be the masses that actually start turning things around. I agree entirely. I think that the reaction of Daily Mail readers is generally a decent barometer for wider sentiments to do with diet and health. Overall, I’d say the signs are positive! Apparently, the research was published in an online supplement of the journal Sleep and the finding will be presented at SLEEP 2013, on June 4. I haven’t found the original report either…. 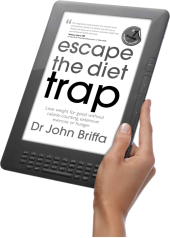 Keep up the good work Dr. Briffa – there are lots of us out here listening and using our own experiences to make our nutritional decisions! The study is available on-line here http://www.journalsleep.org/Resources/Documents/2013AbstractSupplement.pdf but only the abstract is published. It’s on page A335, abstract number 0977. More headline-grabbing epidemiological ‘research’ that does not withstand scrutiny. And there was I naively thinking this was a clinical study in which different meals were fed to study participants to gauge the effects. It turns out to be an epidemiological study, as you point out, from which we are likely to glean very little, if anything. It is so often during discussions on nutritional blogs one person says that something is true according to his/her experience, while another person answers that the anecdotal experience of the first person doesn’t matter because some RESEARCH “proved” over-vise. My experience is those who think science always trumps experience don’t understand the limitations of science and usually don’t really care about outcomes for others (only being ‘right’). The really poor quality of information about health amazes me every time… Everybody know by direct experience that a carb rich meal gets you much more sleepy than a fat rich one. I guess we should not trust every study, for there could be dangerous undeclared conflicts of interest. Many science data are polluted, to me, we better watch out. Sad, but true. I used to nearly sleep at my desk in the afternoons. Then I switched to LCHF and it’s a zero crash life… unless I drink a soda somewhere. That’s extremely likely to make me miserable. Low carb for seven months and still going. Lots more energy, improved sleep, slim and skin looks and feels so much better. I would imagine that when people were asked about their fat intake they immediately thought of foods like icecream, desserts, chips, bacon butties, roast potatoes etc. carbs mixed with fats are a lethal combination. It’s almost like the media are deliberately trying to the public away from trying low carb and keep the low fat, grain heavy, high carb status quo. Now, why would they be doing this…….? How true. And when you think about it, doesn’t most ‘fast-food’ consist of a mixture of stodgy carbs (Buns, pizza-base, pie-crust etc., etc..) and fat. I would guess that in the average burger, there is far more starch than fat. It’s staring the ‘experts’ in the face, but they can’t see that it is the bun that does the damage and not the burger! I am not a conspiracy theorist, but it is easy to note that the grain industry, so important to the economy, is in a strong position to commission all the ‘right’ studies! Very pleased you got my comment on the DM article (see ‘Egglover’). The article appeared to suggest that starch perks you up. Sure it does…for about 10 minutes before you get a monumental blood sugar crash. There are obviously darker forces going on here and, at a time when we’re trying change people’s attitude towards high fat food, I think it’s really irresponsible. 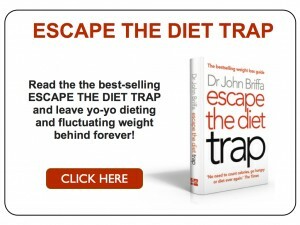 However, for those of us who are lucky enough to have experienced greater physical energy and increased mental clarity on a low-carb eating plan these articles just pale into insignificance. Absolute utter rubbish – but what can you expect in the Daily Mail? Since changing to a low carb, high protein and fat diet I have never felt more alert or better in my life. I used to get that awful tiredness all the time but especially in the afternoons when my diet was high in carbs. This ‘report’ and the twaddle accompanying it should be totally disregarded. If my patients tell me they feel sleepy in the afternoons, that to me is a sure sign they need to stop eating sandwiches and crisps for lunch and switch to protein/fat and vegetables/salad instead. When they do, they stop having blood sugar crashes and feel much more alert. What a load of old cobblers. A work friend of mine used to have what he called his “two ‘o’clock coma.” I was the same. Switching to low carb for breakfast and lunch eliminated that. 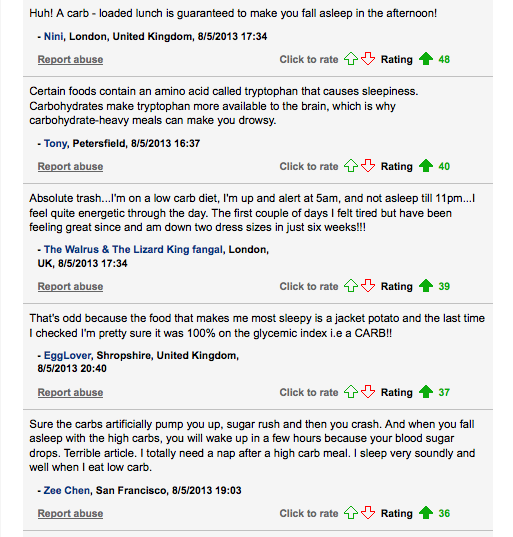 The Mail article shows that the vested interests who would have us stuff ourselves with carbohydrate are still active. I looked at something similar a while ago (high fat meals affecting driver’s concentration) and found nothing behind it. But this will probably be used to back it up now! I can’t stomach reading the article again but didn’t it mention that the test was done over 4 days? As we all know, when you switch from high carb to low carb, the majority of suffer carb withdrawal and can feel headachey, lethargic etc. What kind of study is done over 4 days? And where did Dr Atkins mention eating unlimited quantities of anything? I was going to go off on how a high carb meal is guaranteed to induce a semi-coma, but thankfully the good readers at the Daily Mail already pointed this out. Potatoes and rice don’t affect me, but if I have a binge on anything made from grains (pasta, bread etc) I have to crash (sleep) within 30 minutes. I wake up feeling like I’ve been drugged, very shaky and groggy. There was one time that I was enjoying a caramel slice (shortbread (grains!) base, caramel, topped with chocolate) and my lips started “fizzing”. Again, I was asleep within 30 minutes. I’ve since learned that this was a hypo-glycemic reaction – exactly the same as the grain carb crash, albeit more extreme – and I’ve avoided the caramel slices since, as I was pretty scared at the time that I was about to have some kind of seizure! This is hilarious! Poorly referenced (may even be a fictional study), clearly flawed hypothesis and a nice, healthy side of Daily Mail’s favourite food: propaganda! Apologies for being late on picking up on this; I was away on holiday, making hay whilst the sun shined, or at least not getting drenched. I am now doing pulmonary rehab, and the one thing engraved in our brains is that it is very easy to lose muscle but exceedingly difficult to build it, so a lifetime of weight training lies before me. The one thing we can be sure of it is that I will have numerous severe exacerbations of my bronchiectasis, and pneumonia is a really good way of losing muscle. One would have thought that the dietitians would therefore have put together plans to optimise our nutrition to help us develop the muscle we most definitely need, but the word protein appears not to be part of their vocabulary, and neither does muscle. They bid us eat lots and lots of refined carbs, and assure us that adding in some whole grains will make our diet even healthier. I been on lchf for 12 months, the last few weeks I have been experiencing extreme tiredness after my evening meal, lasts for 90mins on average, really strange, any clues anyone please? I suffered insomnia for years waking with headaches etc and I used to use carbs (self-medicating) to put me back to sleep, eg hot milk and biscuits or a sandwich. I’ve just started low-carbing and feel completely energised. In fact, I am sleeping only 4-5 hrs a night but still fine, no hungover grogginess. My mental alertness is improved on low carb after only one week. I’m a bit puzzled by the change in sleep pattern, anyone else experienced this? I’ve experienced a complete reversal of my insomnia and mental alertness in the 2 weeks I’ve been on Atkins strangely enough. Just went to the dr a couple months ago for complete physical to find out why I’m so tired and all the tests came back normal, except for cholesterol and BP. My diet change has energized me and I don’t have that 2pm coma now either. Feel like I did when I was in my 20;s and I’m 52. 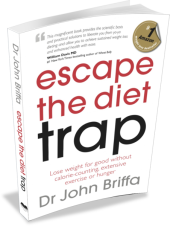 I totally agree with Dr John, but as a nutritionist I have encountered clients who are almost induced into a coma after eating fats. The addition of pancreatic enzymes, including lipase to their diet overcomes this so there is obviously a faulty mechanism with fat digestion at play. I am not sure how this makes one sleepy exactly but it might be to do with the pancreas being overloaded I don[‘t know maybe Dr John can explain this ?